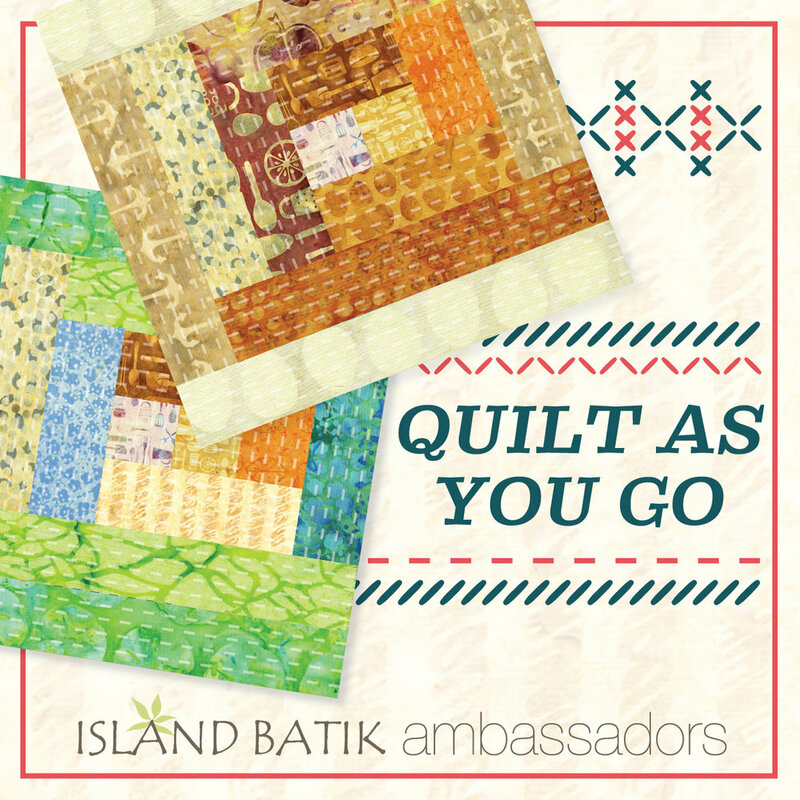 The challenge this month for Island Batik Ambassadors was to make a quilt as you go project. 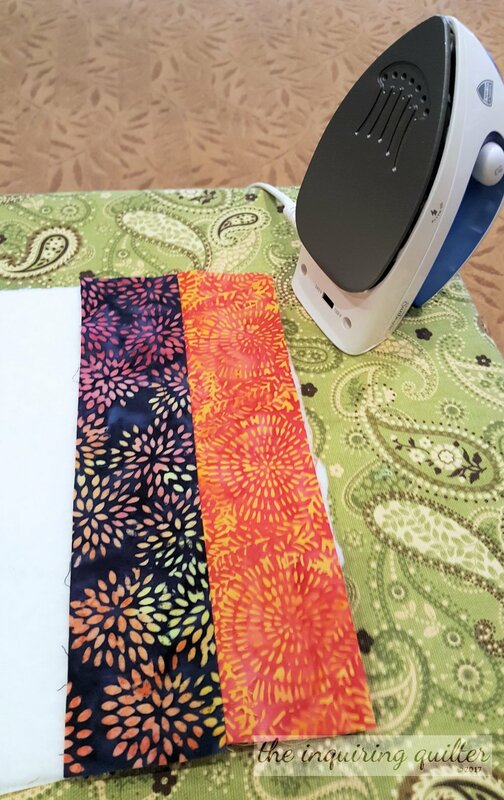 I wasn’t sure what I wanted to do, but I knew I wanted to use the Pressed Petals collection by Island Batik. 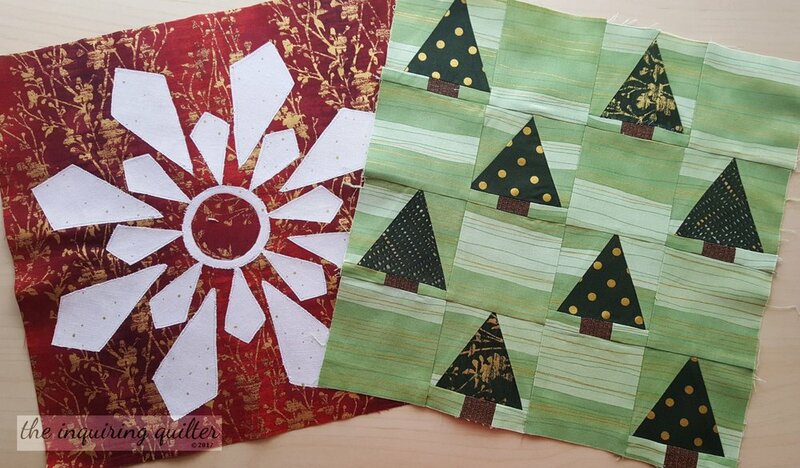 As soon as I found this adorable pattern by Pink Sand Beach Designs, I knew I had my quilt as you go project. The pattern is called the Riviera Handbag. As you can see from the cover of the pattern, it’s not designed to be quilted. That didn’t mean however that I couldn’t replace the outside lower pocket panel (the blue paisley fabric) with a quilted panel. 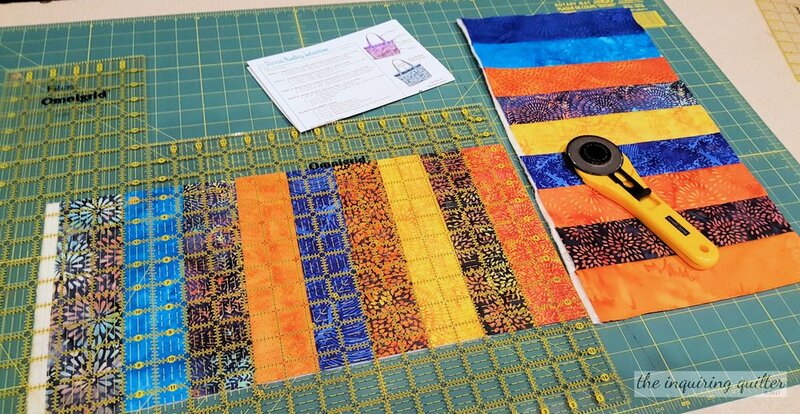 Easy peasy, if you use quilt as you go! After selecting the Pressed Petal strips I wanted to use, I layered the muslin and batting and placed two 2-1/2” strips right sides facing along the batting's right edge. 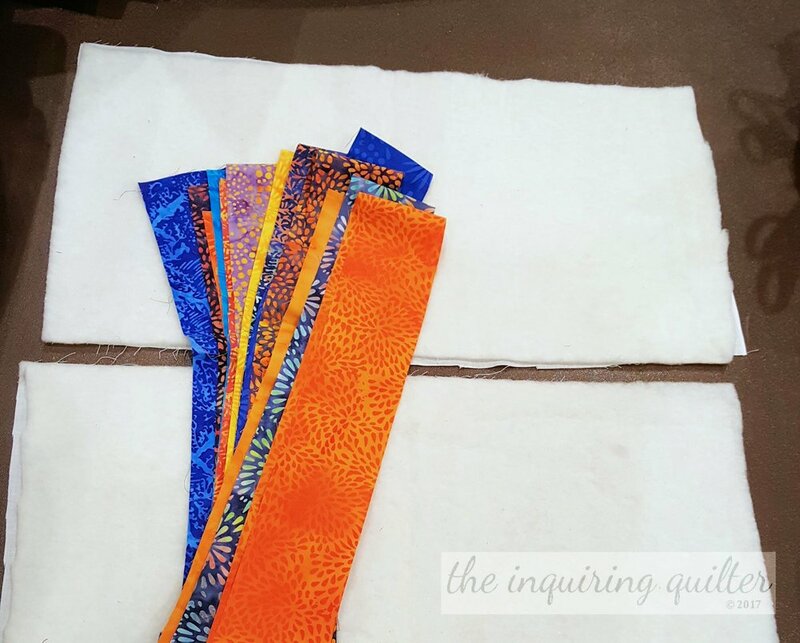 I sewed along the left edge of the strips to quilt them. I know, sewing along the left edge of your sewing machine foot is different, but I chose to do that so I could have the bulk of the QAYG piece to my left and not under the tiny opening of my machine. About halfway through quilting the panel, I switched things around and sewed along the right edge of my sewing machine foot. Next, I pressed the top strip to the left. Then I laid another strip on top of the left strip (RST) and sewed along the left edge as before. I kept this up until I had quilted both of the lower pocket pieces. And that my friends is quilt as you go! When they were done I cut my quilted panels to the size called for in the pattern, then simply followed the steps to make my bag. This pattern was clearly written, with photos for every step so even if you’ve never made a handbag before, you would have no trouble making this! One warning however—there are 30 steps. Yeah I know. 30! Just go slow and look at the photos to double check yourself after each step and you'll be just fine. I’m planning on using the bag to carry my tablet and my bee bag (which contains graph paper, a notebook, and pencil for designing quilts on the go). The outside of the Riviera bag has two pockets—one in the front and one in the back. You sew across the top edge (that tiny orange strip on my bag) of the lower pocket panel to create the pocket. This means the pocket is open all the way across the panel. I decided I wanted the pocket to be the same size as the pocket opening, so I sewed some side seams. Inside, there are more pockets. You can make these whatever size you need. And look! I even put in a zipper! If you want to read about my previous zipper adventures, click here, here or here. I really needed this bag. As soon as it was finished, I put my tablet and bee bag in it. So glad I got to use my Island Batiks to make it! If you haven’t already, be sure to link up to my Wednesday Wait Loss. I’m having a giveaway! And be sure to post your version of Block 2 by midnight EST August 28th. 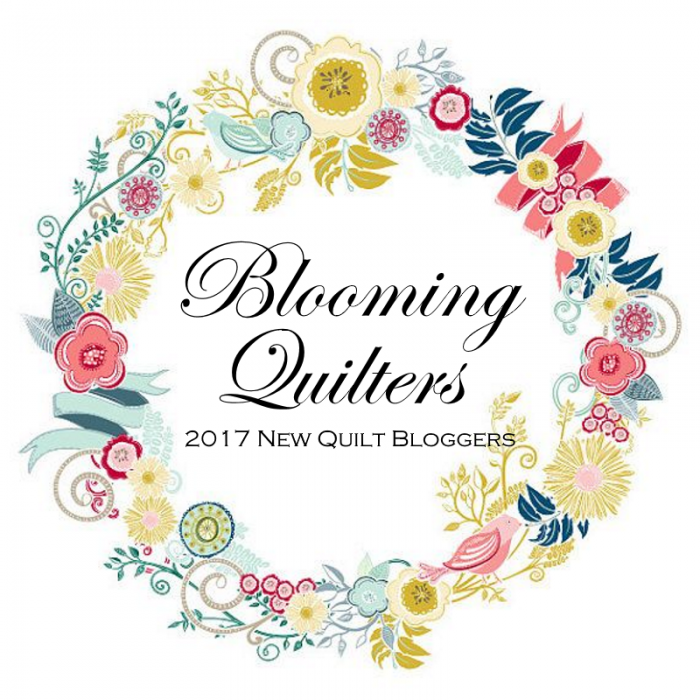 To learn more about the quilt along, including where to get the block patterns and what you might win, click here. 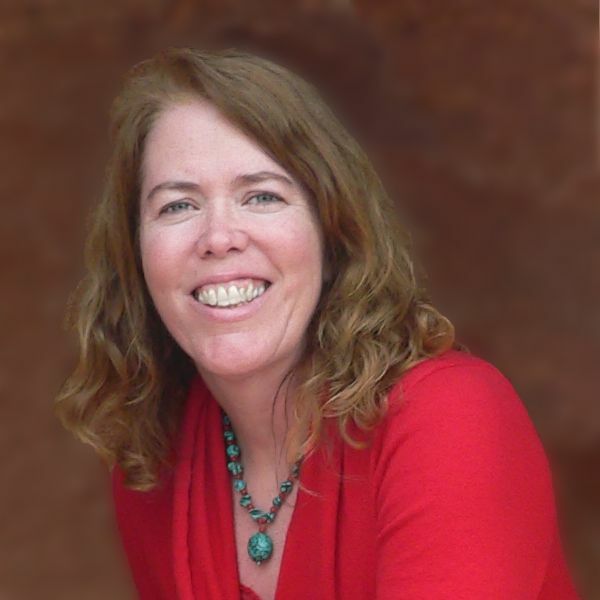 Welcome to My Day on the Island Batik Getaway Blog Hop! Tell me...have you ever made a bag? What do you use it for?